Each episode looks at a different year in Halifax history from 1993 to now. Welcome to 25 for 25, our new weekly podcast in honour of both The Coast's 25th birthday and Halifax. 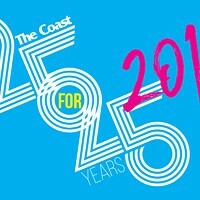 Each episode, podcast hosts/Coast staff editors Tara Thorne and Jacob Boon will look back at one year from the past quarter-century, starting with 1993, the year The Coast was born. Tara and Jacob will discuss some of the big and weird events happening in Halifax at the time, joined by special guests sharing their stories. This page will serve as a kind of homepage for the podcast, with links to each episode's show notes. We hope you subscribe using the buttons above and enjoy. We'd also love to hear what you think about the show, so leave a comment at the bottom of this page, or on the episode page or by emailing letters@thecoast.ca. Author and journalist Sharon Fraser joins us in the studio to discuss local feminist newspaper Pandora—how it was born out of the frustrations faced by local journalists in sexist newsrooms, its mission to be intersectional before that word even existed and the Human Rights case that brought the paper to an in 1994. Then the hosts of CKDU's Black Power Hour, El Jones and Todd McCallum, are here to talk about the original free speech warriors who shut down Dalhousie's attempts at launching an anti-discrimination policy. Tara and Jacob try to clean up the mess that was the G7 summit, stroll down to the waterfront hoping to hit the jackpot at Halifax’s newly opened casino and find out what Bon Jovi got up to after the band's Natal Day concert. The Carleton owner Mike Campbell also drops by to tell us all about the early days of MuchMusic and his one-man show in Atlantic Canada, MuchEast. Then, labour organizer and fellow podcast host Chris Parsons is in studio recapping some of the hits and misses when it comes union battles in the mid-'90s. If you haven't heard prolific writer, former Pride co-chair and all-around lovely person Jane Kansas spin some yarns about the mid-'90s LGBTQ+ scene, you're in for a treat. Then, film professor and local actor Glenn Walton is here to share stories from the set of Titanic—his special relationship with James Cameron, the film's champagne budget and the movie Bill Paxton only thought he was making. The year 1997 is when Mike Savage first tried—and failed—to enter politics. It's also the year his father, John Savage, resigned as premier. The mayor joins us in studio to talk about both events and his family's history in Dartmouth of yore. University of King's College professor Susan Dodd is also here to discuss the Westray Inquiry. If that wasn't enough, on this jam-packed episode we dive into craft beer culture. Garrison founder Brian Titus stops by with Boxing Rock owner Emily Tipton to reminisce about those early days and how the industry has matured two decades hence. It was #MeToo moment decades before #MeToo even existed. Gerald Regan, former Nova Scotian premier and Liberal party statesman, brought to court on eight charges of sexual assault against victims as young as 14. Journalist Stephen Kimber was there watching the trial in 1998 when Regan was eventually acquitted. Kimber joins us on this episode talking about the trial and Regan's tarnished legacy. Also on this episode, we discuss the tragedy of the Swissair crash, Halifax police try to shut down Savage Love, Titanic-mania sweeps through the tourism industry and council starts looking for solutions to cleaning up the harbour. Millennium panic looms over us this week so we try to distract ourselves with art, specifically Andrea Dorfman's debut feature Parsley Days. Dorfman biked by the day after wrapping shooting on her fourth feature, Spinster, aka the source of June's Chelsea Peretti sightings. She talks abortion comedies, shooting in the north end on no budget, and going to TIFF. Also on deck is journalist and author Rick Conrad to tell us about the Chronicle Herald newsroom's unionization saga, which occurred when he was a Herald employee and when he was the president of the Halifax Typographical Union. Our editorial colleague Allison Saunders joins us in studio to chat about Hershey's laying off workers at the old Moirs plant (plus the difference between American and Canadian Pot of Golds). We also run down the greatest Atlantic Canadian albums of all time (as chosen by Coast readers in 2000). Then, Halifax’s urban forester John Simmons drops by to talk about the brown spruce longhorn beetle invasion in Point Pleasant Park. Airport president Joyce Carter calls in to talk about 9/11 and looking after the thousands of stranded passengers who suddenly found themselves stuck in Halifax. Activist Michael Karanicolas is here in studio discussing the erosion of privacy rights in the aftermath of devastating catastrophes. Plus, former AFF director Lia Rinaldo reflects on running a film festival the same week the world turned upside down. Also on this week's episode, Atlantic Canadian musicians are whiny, “Baby Hitler” visits Halifax and we discuss the old ATM next to CD Plus. Stephanie Domet is in studio reflecting on censorship scandals at the Halifax Daily News and ethics in journalism. Mary Vingoe also joins us to talk about the day future-premier and fiddle fanatic Rodney MacDonald killed the province's Arts Council. Then, African Nova Scotian Music Association co-founder Delvina Bernard stops by to tell us how Black musicians fought for recognition in Nova Scotia. Plus, G7 protests, art pranksterism, listener feedback and a violent cat named Cocoa Puff! Author and journalist Phonse Jessome calls in to talk about Operation Hammer—what made the Hells Angels ride out of town and why the cops got lucky. Then, boxer Kirk Johnson shares stories about his landmark Human Rights victory against the Halifax police department for racial discrimination, and why 2003 was such a hard year for him for personally and professionally. Plus, Allison Saunders is back in studio as we discuss Hurricane Juan, Iraq War protests and Tara's first trip to Sundance. Historic music promoter Condon MacLeod is with us in studio talking about the birth, death, rebirth (and death again?) of Halifax's all-ages music scene. Then, Dartmouth icon Gloria McCluskey tells us what made her come back to municipal politics 14 years ago and offers her unfiltered assessment of HRM's current crop councillors. All this plus White Juan covers the city in snow, Tara gets a phone call from Belinda Stronach's office, Jacob meets G-Unit at TGI Fridays, we try to deduce the identity of the real Scott Pilgrim and Ikea is definitely, 100-percent coming back to Halifax. Author (and former Coast columnist) Lezlie Lowe is here chatting about her new book, No Place To Go: How Public Toilets Fail Our Private Needs. Lezlie also sticks around as we talk about the aborted fast ferry to Bedford, stolen deer head sculptures and HRM's failed Commonwealth Games bid. Plus, will 2005 see the resurrection of Halifax's infamous Halloween Mardis Gras? Journalist Erica Butler is also in studio to dissect HRM's Regional Plan, its impact on the city's growth and whether any of this public consultation stuff is actually effective. The (almost) original cast of CBC’s groundbreaking television hit, Street Cents, have reunited for the first time in 25 years. Jonathan Torrens, Jamie Bradley, Benita Ha and Brian Heighton (AKA Ken Pompadour) are this week’s guests on 25 for 25. The three original cast members and Torrens (who replaced host Chris Lydon after three episodes) share stories about the early days of what was affectionately called “Marketplace on acid.” Our colleague Stephanie Johns also joins us in studio with tales from her old job fielding calls for Steet Cents' “What's Your Beef” hotline. All this plus the Junos are coming to town, Sunday Shopping wars end, the Rolling Stones play a ridiculous concert on the Common and Gawker's most infamous journalism moment of the year is a Chronicle Herald ghost story by Peter Duffy. City councillor Lindell Smith was a 16-year-old aspiring audio technician the first time that he was mentioned in The Coast, as part of Stephen Kimber's 2007 cover story, “Inside the Square.” Smith joins us to talk about the stigma surrounding Uniacke Square, his political goals and how the north end has changed over the past decade. Also, it was 11 years ago when the Halifax Cycling Coalition formed in response to the death of a cyclist on Barrington Street. Executive director Kelsey Lane calls in from her vacation to chat about the coalition's history and the exhausting work of improving HRM's streets one metre at a time. All this, plus Island Greek opens, the Apple Barrel closes, Peter Kelly cozies up to the Guardian Angels, the province cracks down on squeegee kids, Celine Dion snubs the city and we say goodbye, one last time, to Helen Hill. It's aJoel Plaskett emergency as the local legend joins us in studio with tales from the road. The storied son of Dartmouth talks about his critically acclaimed nostalgia opus, Ashtray Rock, and his busy year back in 2008. Then, award-winning journalist Matthieu Aikins calls in with reflections on his lauded Coast cover feature about Macdonald Bridge suicides, “Adam's Fall.” All this plus, Peter Kelly goes for a swim, the Spryfield drug wars erupt and we offer some definitive rulings on proper bus etiquette. Former Coast news editor Tim Bousquet joins us to talk about the day the sewage treatment plant failed and what lessons were learned at city hall. Then we get into HRM By Design and Tim's early days live-tweeting council. Plus Paul McCartney comes to town for what's sure to be a successful concert, the Chronicle Herald axes a quarter of its newsroom and, yes, we talk about Brindi. Filmmaker and Africville Museum general manager Juanita Peters is with us in the studio talking about the day Halifax finally apologized for its biggest mistake—the razing of Africville and forced displacement of its community members. Tara and Jacob also dig into the infamous MLA expense scandal, then we expose some drunk city councillors and wade through the concert scandal fallout. All this plus the fire department sues our comment section. Neat! All-around awesome person Rich Aucoin is with us talking about his triumphant year in 2011; headlining the Pop Explosion and releasing his long-awaited album, We're All Dying To Live. Then, arts editor Stephanie Johns is back with stories of outrage from the one time The Coast printed a swear word on its cover. It's pretty fucked up. All this plus the city hits peak scandal, the sleepwatcher is big news, Babylady disappears, we debate James Franco's stardom and The Coast apologizes to Stan Kutcher. We look back at the life and death of Raymond Taavel with his longtime friend and coworker Barry Boyce. Then, Sean MacGillivray stops by to talk about the contentious online community of Halifax Locals, which shut down in 2012. Plus, the Morse's Teas sign is painted over, bus drivers go on strike, King of Donair leaves Pizza Corner, the city sells the Bloomfield Centre to the province, Peter Kelly leaves politics (for now), Mike Savage takes over city hall and Beep drink is back. Former finance minister Graham Steele is with us as we dissect the NDP government's collapse. Then, award-winning journalist Selena Ross chronicles the story of Rehtaeh Parsons. All this plus Halifax baristas unionize, Joachim Stroink celebrates the holidays, Benjamin Moore doesn’t paint the city and The Coast turns 20. 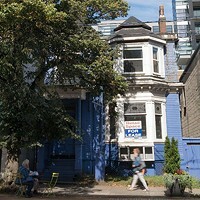 Emily Davidson, noted friend of the Khyber, joins us to talk about her group's efforts to save 1588 Barrington Street from indifferent city staff who wanted the historic arts incubator sold off as surplus back in 2014. Then, writer and artist Kate Leth calls in from Califonia to reminisce on her strange adventure from local illustrator to comic book superhero. Plus, HALIFAX buys itself a bold brand, the new library finally opens, NSCAD gets a fountain of money (but loses a micro-gallery) and something called the Ivany report is released. Ever heard of it? Filmmaker, artist and all-around multihyphenate Cory Bowles is with us reflecting back on when the province killed Nova Scotia's film tax credit. Then we phone up Megan Leslie to find out why Halifax's former Member of Parliament left behind politics and the city after 2015's federal election. All this, plus the city is rendered immobile by a hellacious winter, donairs become HRM's official food, the Rainmen are no more, rich people behave badly and The Coast goes to the movies. This week on the podcast we're joined by Tom Michael, owner of the dearly departed Video Difference, who shares his memories of running Halifax's beloved cinematic landmark. Then, former HRM poet laureate Rebecca Thomas is with us in the studio, talking about spoken word, Cornwallis and her history of activism. All this plus Jacob uncovers missing evidence, Tara writes about the changing music scene and we argue about the Internet Black Widow. The end is here! The 25th episode for 25 years of our little podcast experiment. For one last time, we look back at the bars, bands, businesses, big news stories and Barrington Streets that defined Halifax. Who better to join us on that journey than the most trusted name in Atlantic Canadian journalism? Steve Murphy started hosting CTV's supper-hour newscast 25 years ago and he's with us in-studio to talk about the “recurrent themes” of the past quarter-century, why he doesn’t believe in “fake news” and whether or not he once took a helicopter to a family reunion. Also on this episode, it's the 100th anniversary of the Halifax Explosion and the debut of Cape Breton pizza on the mainland. The Proud Boys show up to defend Cornwallis, Lido Pimiento plays the Pop Explosion, the Convention Centre finally “opens” and Michelle Coffin tells her story. We've got street checks, Saltwires and Joel Plaskett trapped on Georges Island. What else could you want? What’s with the historic empty house at 5517 Spring Garden Road?